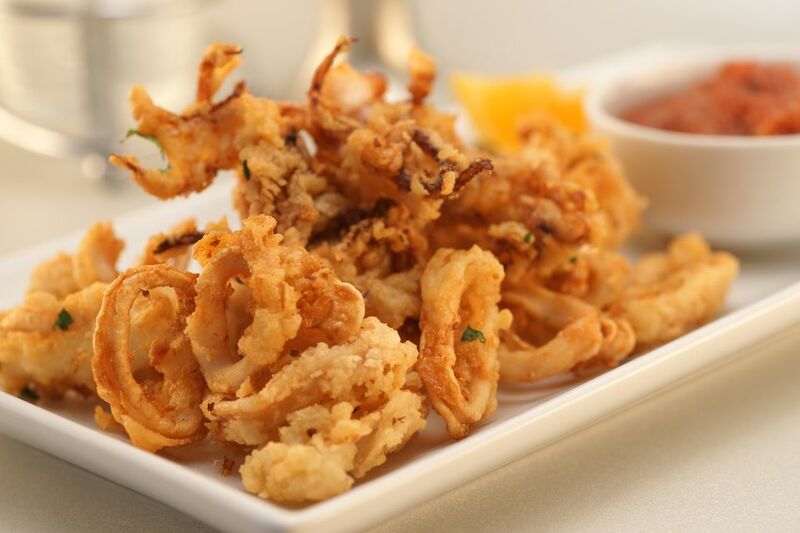 The word calamari comes from the Italian for "squid." In the United States, it generally refers to a battered and deep-fried appetizer served in restaurants and bars, though some people use it interchangeably with the main ingredient, the squid. While many Mediterranean countries serve some variety of squid, it's also popular across Asia. Spanish and Italian cooks add squid to paella, risotto, soups, and pasta, while in Portugal, you can find lulas, grilled whole kebabs of squid rings with bell peppers and onions. In Korea, fresh squid is often served deep-fried, then wrapped with mustard or chili sauce in lettuce leaves. In many Asian countries such as China, Thailand, Japan, and Taiwan, squid is grilled whole and sold at food stalls and stands. You can find more heavily spiced squid in stir-fries, and rice and noodle dishes in Chinese and Southeast Asian cuisine. More than 300 species of squid live in the world's oceans, but fewer than a dozen make up nearly the entire global market for culinary use. A mollusk related to both the cuttlefish and the octopus, fresh squid may be marketed as calamari in an attempt to make it sound more upscale (and worth a higher price tag), but there's no actual difference. Squid can range in length anywhere from 1 inch up to 80 feet, but most of the culinary specimens measure less than 12 inches. Like its cousin the octopus, the squid has a protective mechanism that releases a dark ink into the water when it senses danger. Squid lends itself to hot and fast cooking methods such as grilling, broiling, sautéing, and deep-frying. It can also be eaten raw, such as in sushi. Or try a low and slow braise in white wine and garlic or tomato sauce or curry. Squid can be purchased fresh, canned, frozen, dried, and pickled. The salty black ink can be used to color pasta and risotto. Although the tentacles are edible and often included on a plate of fried calamari, the body is the prime section of meat; it can be stuffed whole, cut into flat pieces, or sliced crosswise into rings. The meat is firm and white with a mild, slightly sweet, almost nutty flavor. Small fried squid are often firm and chewy, but they should not be rubbery. Fried calamari usually gets served with a garlicky aioli or a marinara sauce for dipping, and in any preparation, squid readily takes on the flavor of the dish. The mild flavor makes squid a good introductory seafood; it's also a versatile protein that cooks quickly and works well in a wide range of dishes, making it a good weeknight choice instead of the old standby chicken. Classic fried calamari may be paired with just salt and lemon or with a dipping sauce. Squid used to be a specialty item, but nowadays most well-stocked grocery stores and fish markets carry it. You can often buy it already cleaned, especially from the freezer section. But don't be shy; ask the fishmonger to do it for you if you want to avoid the mess (though it's actually an easy process to clean a squid). Unlike a lot of seafood, squid freezes really well. You can buy it that way at the grocery store, or clean fresh squid and freeze it on your own in zip-top freezer bags. It lasts for a couple of months if it stays solidly frozen. Cooked squid can be stored in the refrigerator for a couple of days, but classic-deep fried calamari definitely tastes best consumed immediately. Like most seafood, squid contains many nutrients, including protein and significant levels of zinc, selenium, and vitamin B12. However, deep-fried squid contains high levels of saturated fat, sodium, and cholesterol. While calamari is the most common dish served in restaurants, other dishes that include squid, such as pasta, paella, soups, and salads, may be a bit easier on the waistline.